Adults over the age of 65 years are now the fastest growing segment of the Canadian population. Although individual differences exist, aging is commonly associated with impairments in executive function and episodic memory. 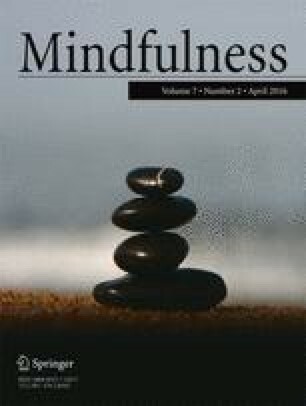 Previous studies have shown that mindfulness-based stress reduction (MBSR) can improve cognitive function in healthy younger adults, but no studies have yet examined this effect in older adults. The present study investigated the effectiveness of MBSR on improving executive function and episodic memory in older adult as well as its effectiveness in improving perceived stress and well-being. Ninety-seven healthy older adults were randomly assigned to either MBSR (n = 57) or an active control group (n = 40). It was hypothesized that compared with the control group, the MBSR group would display significant improvements in measures of executive function, episodic memory, mindfulness, mood, self-esteem, and quality of life. No clinically meaningful changes were found on any variable. In light of these results, the value of MBSR for this population is discussed. We would like to thank Katy Curtis, Robin Hurlow, Kirstin Bindseil, and Dr. Farah Jindani for helping us lead the MBSR groups. We would also like to thank all research assistants of the Stress and Healthy Aging Research Lab who helped with testing procedures. This research was partially supported by Ryerson University’s Health Research Fund.